People have been eating fruit for centuries all around the world. People have also been consuming carbonated drinks, but what would happen if you combined fruits with carbonation? One morning I saw a video on the internet of someone making carbonated fruits and I thought it would be super cool to try out in our chemistry class. When I arrived in chemistry class, Mr. Beals introduced us to this project and I thought it would be the perfect thing to try out for this! I hope you enjoy learning about this as much as I did! Co2 The solid form of carbon dioxide. It is used primarily as a cooling agent. Its advantages include lower temperature than that of water ice and not leaving any residue (other than incidental frost from moisture in the atmosphere). Dry ice sublimes at −78.5 °C (−109.3 °F) at Earth atmospheric pressures. This extreme cold makes the solid dangerous to handle without protection due to burns caused by freezing. Comprising two oxygen atoms bonded to a single carbon atom. Watermelon: contains Lycopene which is a carotenoid pigment, like beta-carotene (the compound that gives carrots their orange color). The aroma is contributed by a variety of chemicals generated by enzymic oxidations and fatty acids when the watermelon is cut. Aroma impact compounds are C6 and C9 Aldehydes. Come from Africa. Two key molecules in the aroma of strawberries are furaneol and methoxyfuraneol. Their concentrations increase as the fruit ripens reaching a maximum when the fruit is fully ripe. Like many other fruits strawberries get their color from anthocyanidin. These compounds come from the addition of a molecule called an anthocyanidin to a sugar. The major present in strawberries is pelargonidin three glucoside. A variety of compounds contribute to the strawberries flavored with sweetness and the city playing a major role. Sweetness develops as the strawberries ripen a process driven by auxin hormones. Acidity primarily from citric acid decreases during the ripening process. Grown in California. Dry ice: man made The liquid carbon dioxide is injected into either a block press or pelletizer. These dry ice production machines have chambers in which, once released to atmospheric pressure, the liquid carbon dioxide converts to dry ice snow and carbon dioxide gas. Carbonated fruits are too modern and so there is no possible background information to be found. Directions and recipes for carbonated fruit. 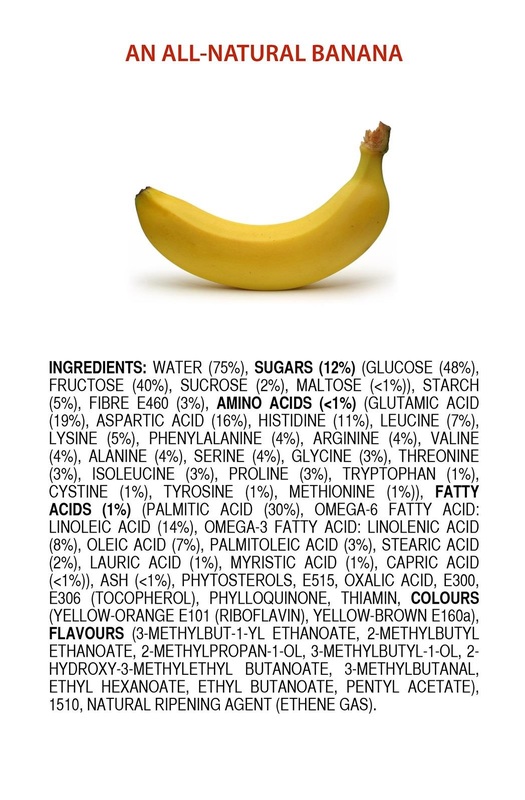 A picture of a banana with what it is made up of. Tells what grapes are made up of. Camille Castles is a junior at Billings Senior High. She has lettered in band and softball. She really enjoys sciences and wishes to pursue a career in the Nutritional Science field.